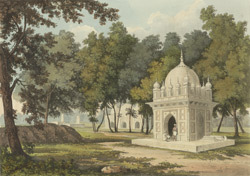 This is plate 19 from Charles Ramus Forrest's 'A Picturesque tour along the rivers Ganges and Jumna, in India'. Forrest was an East India Company official who made several excursions along the great rivers, producing drawings "attentively copied from nature, and in many instances coloured on the spot, ... while the magic effects of the scenes represented were still impressed on [his] mental vision." In December 1807, he set out with companions on an excursion to various towns along the riverbanks. Leaving Allahabad, they proceeded through the Doab (literally, 'the country of the two rivers', being situated between the Ganges and Jamuna) and following the course of the Jamuna. Forrest wrote: "The Cane, the Betwah, and the Sinde rivers join their tributary streams from Bundelcund on the south-west and oppsoite bank of the Jumna, during its course past the province of Korah...Proceeding on these as far as Etwah...and taking a new direction by the village of Jeswuntnagurh," they came upon these beautiful Muslim tombs in a thick grove.